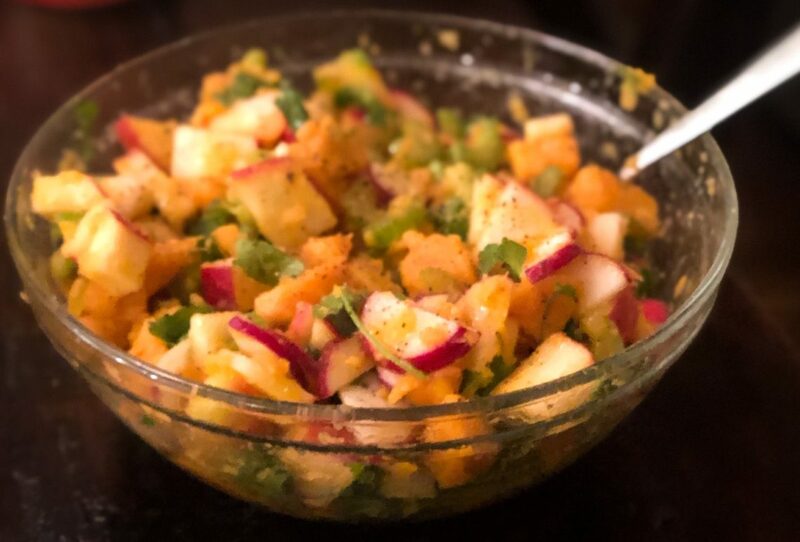 This sweet potato salad is one of my absolute favorite dishes to make every year after the wonderful (but indulgent) holiday season has passed. 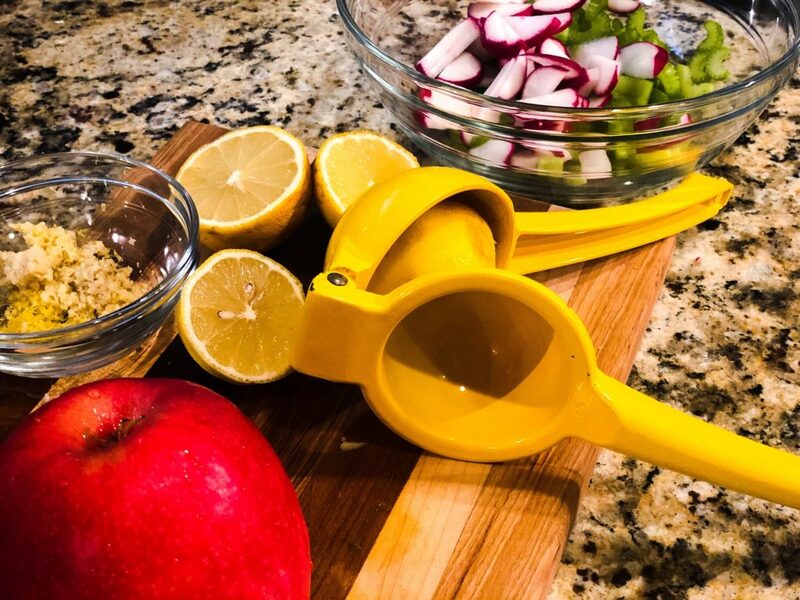 I’m admittedly a sucker for anything with citrus and ginger, but when January rolls around, my body is crying out for food that is fresh, clean and healthy. 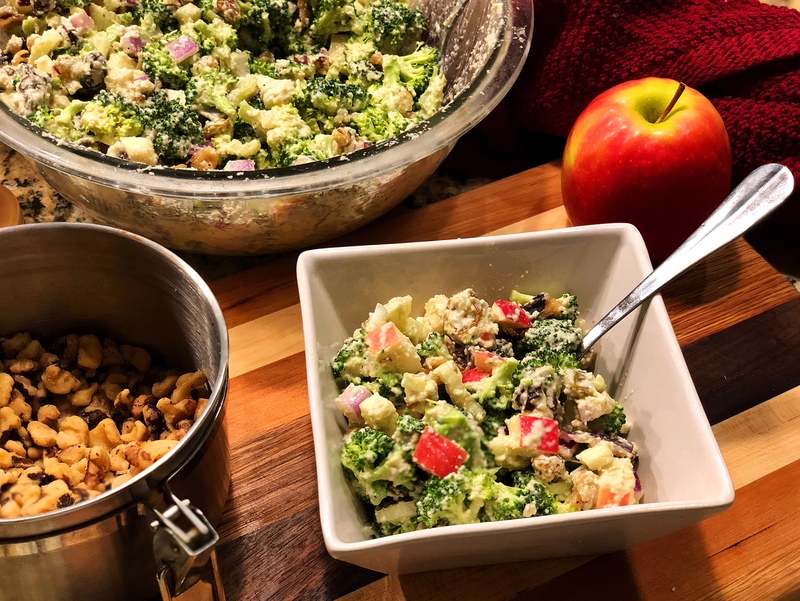 This dairy-free version is packed with filling, crunchy fiber from the apples, celery, and radishes. Even if you down half the recipe in one sitting (purely hypothetical, y’all! ), you’ll be full without being stuffed. 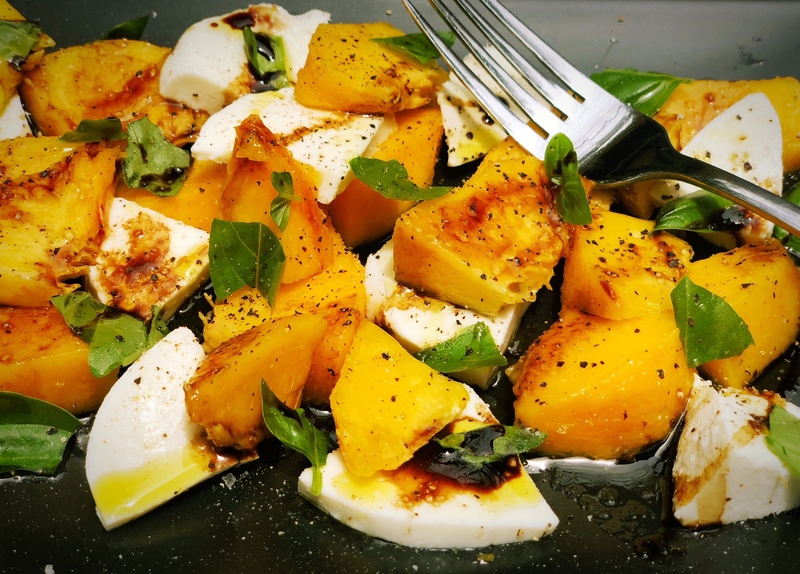 This recipe is an adaptation of one I once tried while doing a Martha Stewart Whole Living 4-week cleanse several years ago. While many people love a juice cleanse, I prefer a program focused on whole, fresh foods because I can see how my body feels while eating “clean” and pick up practical recipes to incorporate after the program. The Whole Living version of this recipe was beautiful, but I couldn’t fully embrace the taste of raw sweet potatoes in the original recipe. So I pulled inspiration from a more typical potato salad, cutting my ingredients into cubes or coins and cooking the sweet potatoes first. My favorite thing about this dish is that it INSTANTLY makes me feel like I’ve been eating clean all week, even if I just spent most of the weekend “quality-testing” batches of buttercream and red velvet cake for a friend’s going away party shark cake. This healthy (vegan!) dish is the “anti-potato salad” potato salad. Say goodbye to heavy mayo and say hello to bright citrus, spicy ginger and zesty cilantro! 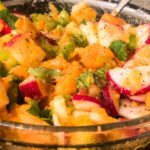 The added crunch of apples, celery and radishes makes this special sweet potato salad a sensory and healthy delight. Fill a medium saucepan with water. Salt water with 1 tsp salt. Place over medium high heat and bring to a boil. Meanwhile, wash and peel sweet potatoes. Cut potatoes into 1/2 inch cubes. 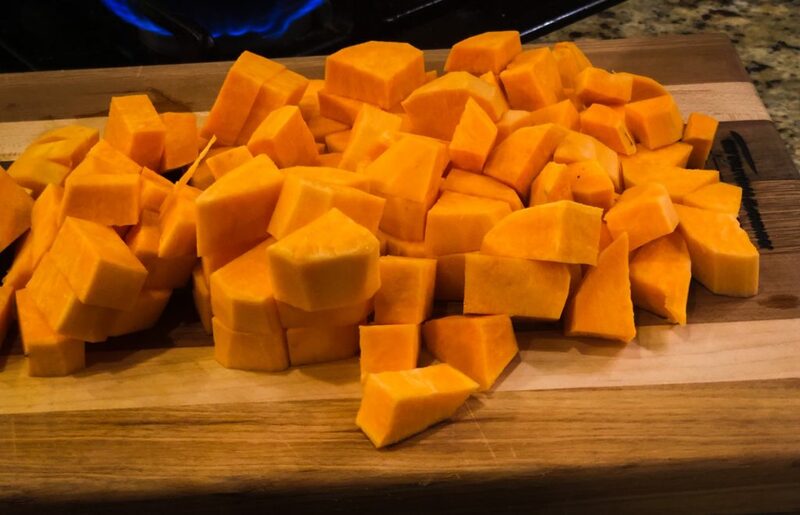 Once water comes to a boil, add sweet potatoes and cook until just fork tender, about 10-15 minutes. Strain and plunge into a bowl of ice water to stop cooking and chill down cooked potatoes. In a small bowl, combine ginger, zest, and lemon juice. Using a fork, quickly whisk in olive oil to combine. Taste and season with salt and pepper. Set aside. Rinse and chop celery into 1/4 inch moons. Rinse and trim ends from radishes. Cut into 1/4 inch coins. Strain sweet potatoes from ice bath. In a large bowl, combine sweet potatoes, celery, radishes, and apple. 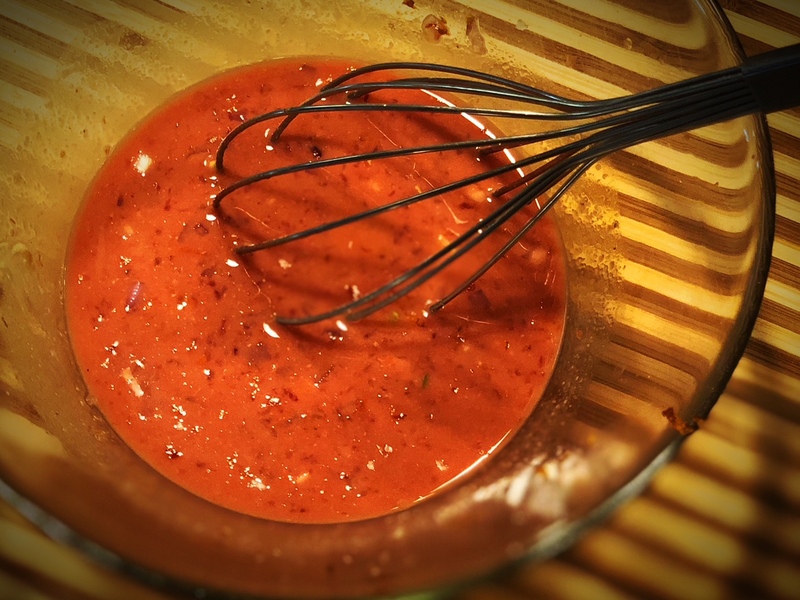 Drizzle with lemon-ginger dressing and toss to combine. Wash cilantro thoroughly. I recommend plunging cilantro into a small bowl of water and swishing it around a few times to loosen any dirt. Drain and repeat the process a few times until water remains clean. Dry. Tear or chop leaves if you like and add to salad. Toss to distribute. Taste salad to check seasoning. Add additional salt and pepper, or even lemon juice if you’d like a more tart taste. Finish with a glug of nice olive oil. Can be served at room temperature or chilled for 30 minutes to allow flavors to meld before serving. Add one minced green onion (scallion) to the salad mix. I’d recommend soaking the onion in an ice bath for 20 minutes first to cut some of the pungency of the onion. Omit the cilantro if the flavor offends you. Add extra lemon zest and grated fresh ginger to brighten the flavor. A little lime juice could be fun as well! Top with some toasted sesame seeds or roasted sunflower seeds for extra protein and crunch. Top with fresh, chopped avocado for additional healthy fats and creaminess.